"Crocus Sativus L." is the scientific name of the plant of Saffron, derived from genetic mutation of the Crocus Cartwrightianus (plant native of the island of Crete). 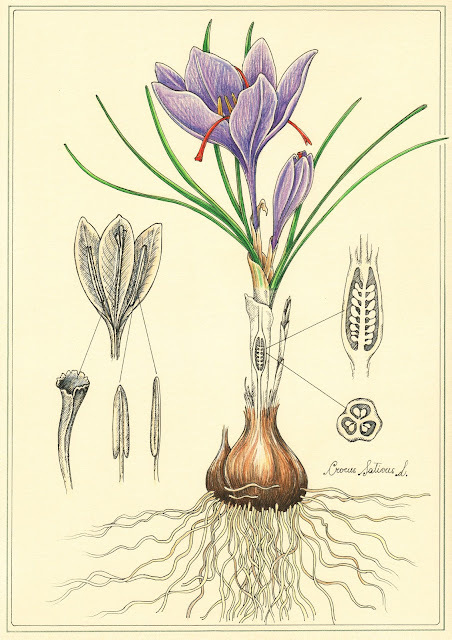 The botanical illustration is larger than the original size of the crocus plant, and marks the main features of the plant: inflorescence, stamens, perianth, anthers, trifid stylus, stigma, ovary three niches, bulb and roots. The spice comes from the raised stigmas, red filaments which are picked up by hand with great care: saffron is so precious to be called "red gold". Saffron owes its characteristics to the active substances such as safranal, which is the main aroma component, the crocines responsible for the color and picrocrocin which gives it its characteristic flavor. fineline drawing pen, watercolor pencils, watercolors.